Permabond UV-curable adhesives are single part, cure on demand adhesives suitable for bonding a wide variety of substrates. Upon exposure to UV light, Permabond UV curables will cure to a high strength in a matter of seconds. •They are excellent for bonding glass to glass or glass to metal and form very high strength bonds for load bearing joints, such as those found in glass furniture and display cases. • Flexible and stress absorbing, Permabond UV curable adhesives are suited to applications where substrates with different thermal expansions need to be bonded. •Permabond UV curable adhesives bond a wide variety of plastics. Some clear plastics contain UV stabilizers that block the transmission of UV light, however, Permabond has formulated plastic bonding adhesives with UV and visible light curing capabilities to allow these plastics to be bonded. • Permabond’s technical staff can help you identify the UV transission characteristics of the plastic you are using and assist you with selecting the best product for your application. • Permabond UV curable adhesives cure during exposure to ultra violet light. The adhesives contain photo-initiators that react to specific wavelengths of light to cure the adhesive. • UV adhesives do not dissolve, melt or weaken the two components. They form strong chemical bonds between the two substrates and provide a high strength alternative to other joining methods. • Curing lamps are available in a variety of intensities from small inexpensive hobby type lamps to high intensity units for high speed production. Permabond will help you select the equipment best suited to your specific application. •Cure on demand - allows proper alignment of components before bonding. •Speed - increase production by simply adding more lamps to the line. •Non-flammable and solvent-free - supports a safe and comfortable work environment. •Single part product - No mixing required. •100% solids = No waste. •Save energy and space - UV lamps require less electricity and space compared to ovens. •Appearance - UV adhesives provide a pleasing finished appearance. •Technical support- application specialists available for assistance with joint design, adhesive selection and production process. 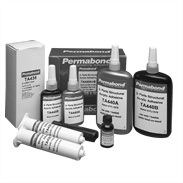 This table represents a selection of the complete range of Permabond UV-curable adhesives. For more detailed technical information and Technical Data Sheets please call the our technical advisors will recommend the best adhesive from our existing product line or assist in developing a custom formulation. Permabond UV7141 UV7141 UV and anaerobic curing. The variables affecting cure speed include the wavelength and intensity of the light source, distance from the light to the bond site, UV transmission of the components, and the thickness of the adhesive. Permabond’s technical staff will assist you with the right combination for your application.The information given and the recommendations made herein are based on our experience and are believed to be accurate. No guarantee as to, or responsibility for, their accuracy can be given or accepted, however, and no statement herein is to be treated as a representation or warranty. In every case we urge and recommend that purchasers, before using any product, make their own tests to determine, to their own satisfaction, its suitability for their particular purposes under their own operating conditions.